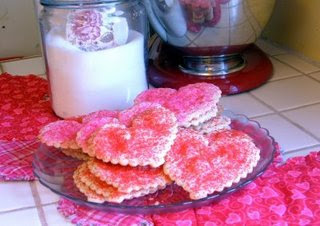 This thin little sugar cookies are incredibly light, with just a hint of nutmeg. They can be rolled more thickly and slathered with frosting, but we prefer them thin and dusted with colored sugar or sprinkles. These were the cookies my Grammy Snelling made for us at Christmas every year. I like to make them for more than just Christmas...really any holiday will do! Just vary the cookie cutter and sprinkle or frosting colors according to the occasion. Oh, and you might want to double the recipe. Just sayin'. Cream together the Crisco and sugar. Add eggs and whip until light and fluffy. Add cream, nutmeg, lemon rind, and baking powder and mix. Stir in flour to make a stiff dough. Chill at least 1 hour. Roll thin and cut out with a floured cookie cutter. Place cookies on a lightly greased cookie sheet. If using sprinkles, add them before baking. Bake at 350, 7 minutes for thin cookies- up to 12 minutes for thicker cookies. This recipe is linked to Tasty Tuesday. Those are beautiful. Your Danish cookies can go with my Swedish pancakes...hee hee :) Thanks so much for linking up to Tasty Tuesday. Look who sent me a hug!